Enjoy the view and soft breezes wherever you are! Park it and pop the top. It’s that easy! The Penthouse streamlines to blend with the styling of the Transit van, minimize fuel reduction and cross-wind handling effect. Available for RB and EB low roof vans. Makes your interior more spacious with a high ceiling. Sleep two upstairs with the optional bed. Five large screen windows provide lots of cooling cross-ventilation, and great visibility. 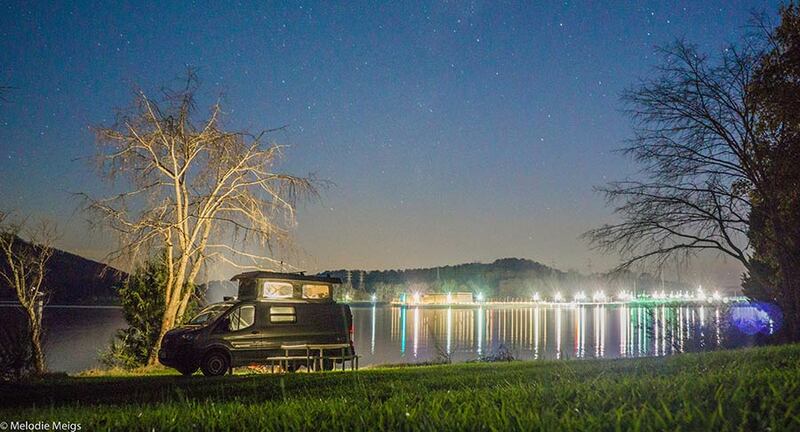 Enjoy the scenery during the day and the stars at night. Soft vinyl side windows have double zippers so you can leave the tops of the windows open that are protected by the top’s eave when it’s raining. For privacy the front window flap zips closed. Side windows have opaque curtains that roll up/down. Penthouse raises full-level, not at a slant that reduces the interior space and restricts the sleeping position at one end. 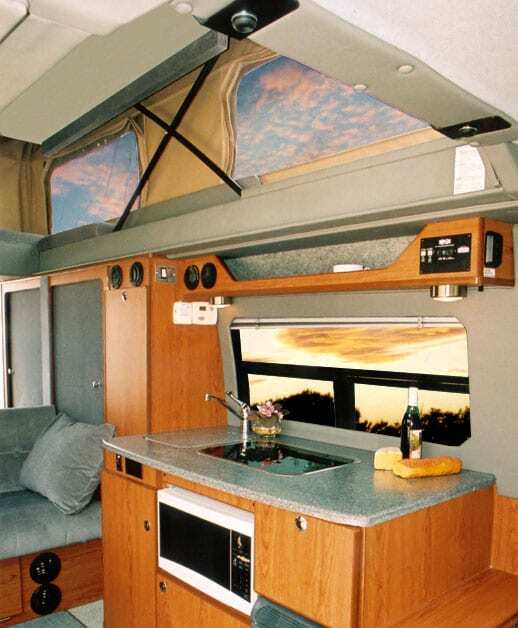 The Penthouse is nicely styled to blend with the Van’s good looks. Crosswind handling effect? Fuel economy reduction? Very minimal. Note: Maximum top load including a top rack is 200 pounds. About $10,500 with bed and power. Installation by appointment: One day, two days if power. Experience? We designed our first expandable top in 1961. Several different models evolved after that until we developed our current top. The first full roof size model with the patented dual “U” tube and a mattress bed in place elevating system. Many thousands have been installed on Ford, Dodge, Chevy, VW, and Mercedes-Benz vans since then. Pop the top for a more roomy interior, refreshing cross ventilation, and enjoying the view. There’s room for two in the upstairs pop top loft. It’s a fun and comfortable place to nap or enjoy a good night’s sleep. 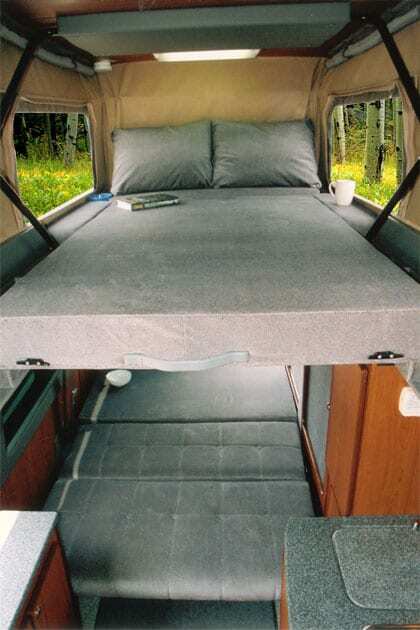 The main bed section is made of the same soft and firm foam as Sportsmobile’s seats/beds. No closed-in feeling with a ceiling height of about 30″ and large windows that help provide an open feeling. A ladder is (o). 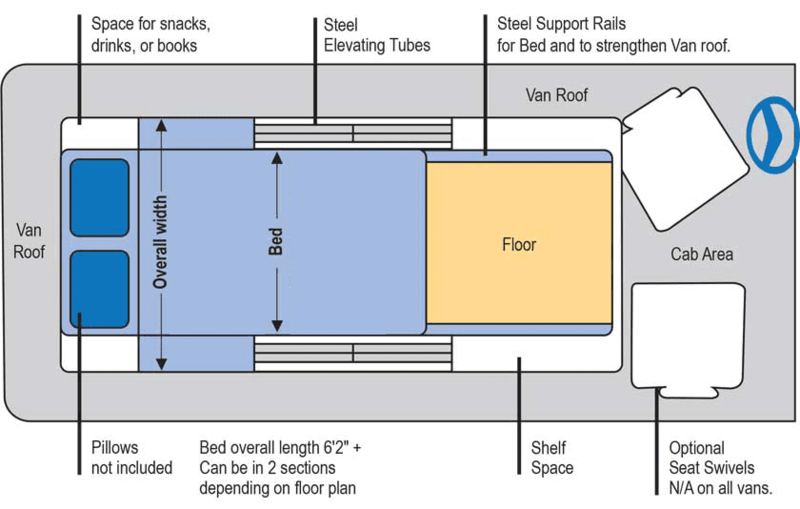 When the main bed section is attached to the ceiling, bedding can be left on top. When the bed is attached to the ceiling, this space provides a convenient shelf. Like to read in bed? LED lights provide plenty of soft light. There’s even space for snacks and drinks. For privacy, opaque curtains roll up and down. Front 3 window screens unzip and roll down. Great for photo shooting or just for a more open feeling. Various roof racks are optional. The Penthouse easily raises up and down. If you include the electric top, simply unlock the latches and push the switch. 12V motors do the rest. Be sure you “unlock” first. What’s the durability of the Penthouse Pop Top? We really don’t know. Since we introduced our third generation model in 1974, we have very rarely replaced a part because of wear. The top itself is made of reinforced fiberglass. Metal parts are all heavy duty construction. Counter-balancing tension and compression springs are over-engineered. This means they will never fatigue and lose their strength. However, if you have an electric top (o) and you do not unlock the latches before you raise it, you will bend the elevating u-tubes. The 12V motors are powerful. If you do bend them, the u-tubes can be replaced by Sportsmobile. Sidewall material is tough and weather resistant. Its convertible car-top vinyl-impregnated fabric exterior is easy to clean. The fabric interior is mildew and condensation resistant. Since it doesn’t breath it helps hold heat out in summer and inside in the winter. Tempshield bubble foil, with a down R-Value of 14.9, is sandwiched between the fiberglass top shell and ceiling panels. We built our leakers decades ago. The top will not leak. Should a leak ever develop, it would be very easy to fix. Is the van roof cut-out reinforced? Yes. The front roof van rib over the cab and the rear rib are not removed. 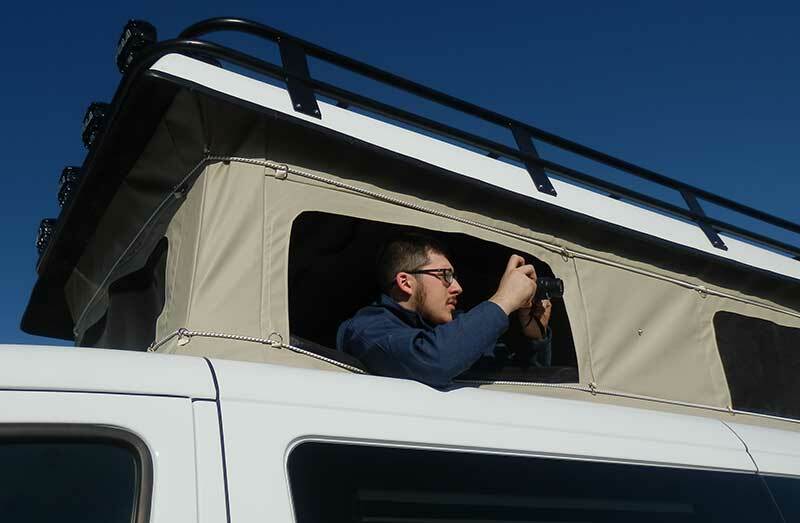 The sides and rear of the roof cut-out are framed with 14 gauge steel, bolted to the van roof. 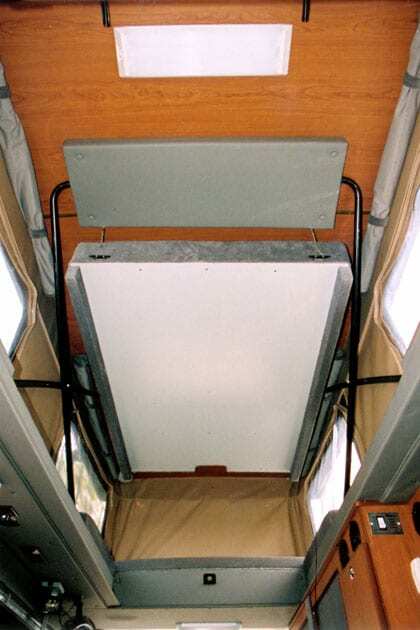 This heavy steel frame reinforces the roof, supports the optional bed, and is the base for the elevating assembly. Actually, we feel the roof is stronger after the Penthouse has been installed. It easily passed the FMVSS 216 roof crash test (see below). Why is the “dual-U-tube” elevating assembly important? We feel this patented system is the model of simplicity, a straight forward means of making the top go up and down. Dual compression and tension springs working with the dual-U-tubes makes the raising/lowering of the top quick and easy. An electric top is optional. No need to lower the top unless it really gets strong. Some companies make much taller tops when raised which will make them more subject to wind rock. 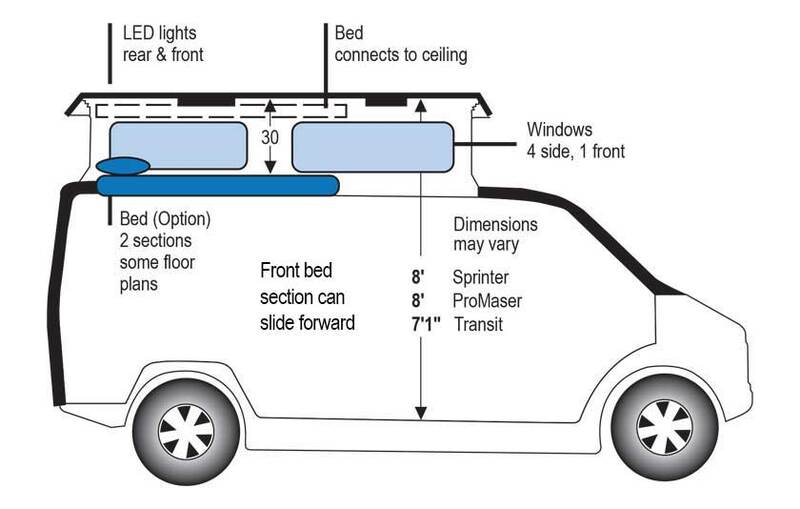 The following test and specifications are met by Sportsmobile to install Penthouse Pop Tops on RB low roof Sprinters. Roof Crush Resistance Test FMVSS 216 (Federal Motor Vehicle Safety Standards) — General Testing Laboratories conducted the Roof Crush Test on 07/02/2008. The Sprinter RB with Sportsmobile’s Penthouse Pop Top more than exceeded the test weight requirements. Roof Weight — Mercedes-Benz allows a maximum added roof weight to the Sprinter of 660 pounds. Note: Some pop tops, especially if they go up much higher, can weigh considerably more. 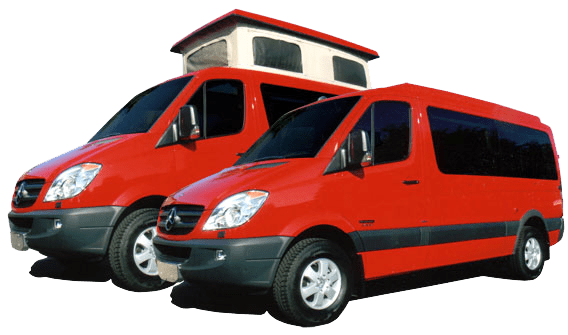 If you added a roof rack and much cargo you may exceed the Sprinter’s maximum weight. The Penthouse Pop Top — installed adds about 345 pounds, a difference of about 315 pounds. Center of Gravity — With our RB-50 Conversion and the Penthouse Pop Top, the center of gravity is 45.8″, well below Mercedes-Benz specified 51.2″ maximum. 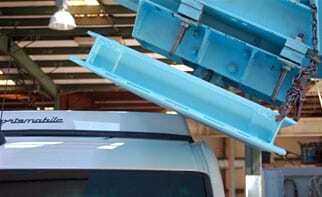 Important — Sportsmobile is the only company approved by Mercedes-Benz to partially remove the Sprinter roof and install a pop top on a Sprinter RB low roof. Not on a high roof van. It’s very important that a top not exceed Mercedes-Benz roof weight and center of gravity specifications. Photo taken at start of test. A force of 11,042 pounds was applied. The Sprinter with Sportsmobile’s top easily passed with minimal damage done to the Sprinter van or the Penthouse top.